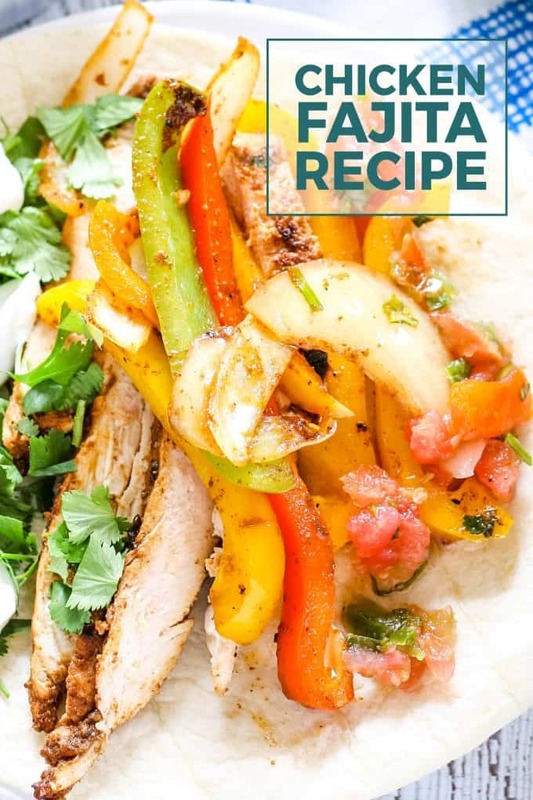 Make everyone happy with this chicken fajita recipe. 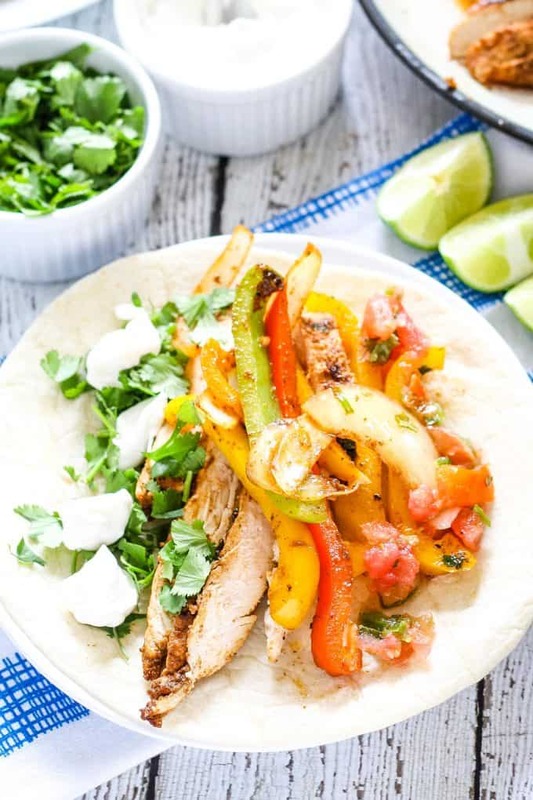 Chicken fajitas are the perfect recipe for summer family dinners plus bell peppers, onions, and spices! I recently pulled my indoor grill out of a box and used it to make this chicken fajita recipe. Very, very nice and convenient! It kind of made me feel like I was not in the midst of a Chicago cold spell. That alone is a success to me. These fajitas are amazing and I totally recommend you try this recipe. There are several ways to grill chicken if you don’t have a grill or it’s too cold outside to grill. 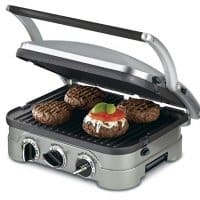 One, you can use an indoor grill – I recommend reading the instruction book to get cooking times. 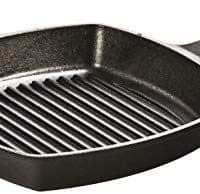 Second, you can use a grill pan; if that’s what you use, cook the chicken as though you were cooking it on a regular pan. The ingredient list below may look long but it’s really just the marinade ingredients, chicken, vegetables, and tortillas. Once you have left the chicken marinade for 1-2 hours, you’re ready to get cooking. Grill your chicken and vegetables, heat up your tortillas, and you’re ready to eat. Tip: if using a traditional grill, I recommend using a grill basket for the vegetables. 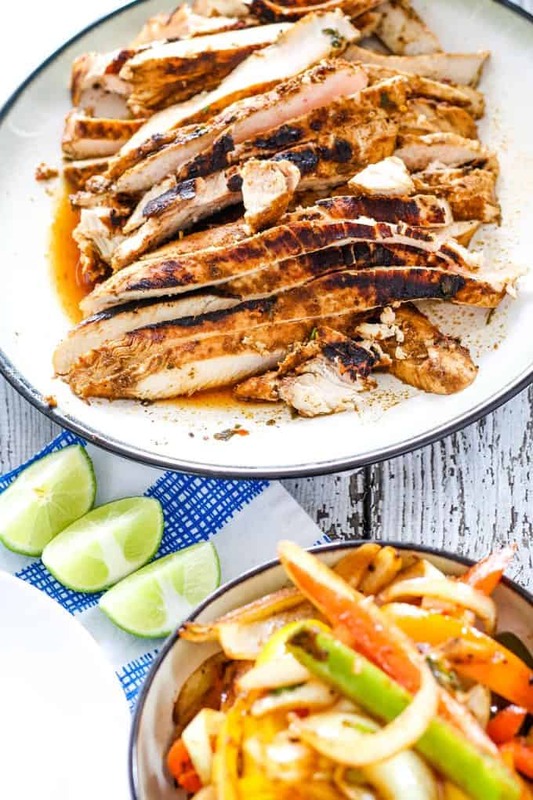 My absolute favorite part of this recipe is the fajita marinade. It includes some of my favorite ingredients and can easily be made ahead of time. The marinade is a mix of sweet, sour, savory, and bitter – the perfect blend. Can I use fajita seasoning? Yep! If you plan to use fajita seasoning, replace all of the spices and the garlic with 6 tablespoons of seasoning mix. Besides the traditional chicken fajita vegetables (bell peppers and onions), you have your choice of many toppings. You can use this recipe to make steak fajitas or vegetarian fajitas. I recommend skirt steak if going the steak route. What to serve with fajitas? So many options. I like to serve fajitas with rice and beans. My seasoned black beans are perfect for chicken fajitas! 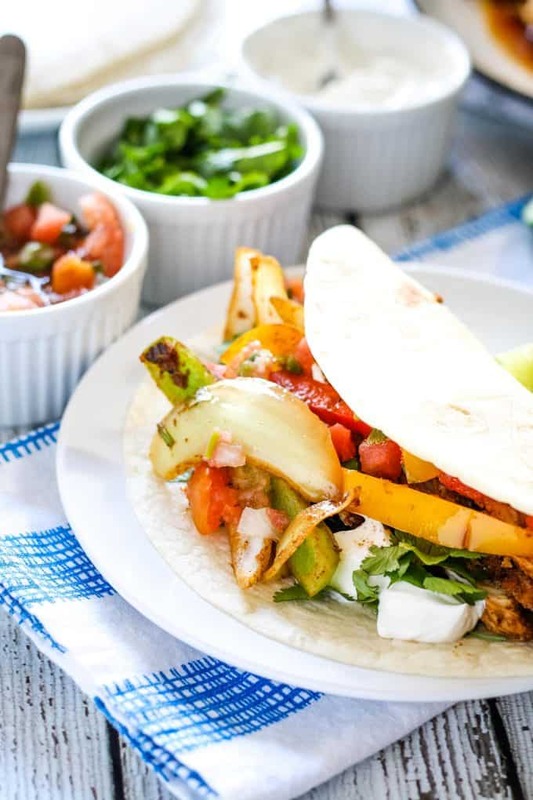 Make everyone happy with this chicken fajitas recipe. 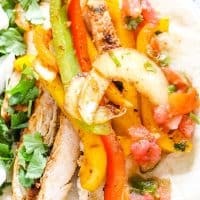 Chicken fajitas are perfect recipe for family dinners! - everyone can make their own fajitas. In a small bowl combine all the marinade ingredients and mix well. Put the chicken breasts in one bowl and the peppers and onions in another. Pour half the marinade over the vegetables and the other half over the chicken. Mix well, cover and refrigerate for 1-2 hours. Remove the chicken and vegetables from the refrigerator. Prepare your grill for high heat. Grill the chicken on both sides until it has reached an internal temperature of 165 degrees F. Remove from grill, cover and set aside. Then grill your vegetables until tender - about 10 minutes. 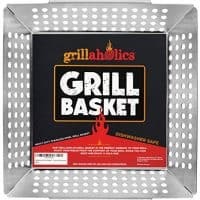 If using a traditional grill, I recommend using a grill basket. Toss occasionally. Wrap your tortillas in a damp paper towel and warm in the microwave to 10 seconds just before serving. Cut the chicken into strips. To serve, place chicken in a warmed tortilla, top with vegetables and then with you topping of choice. Well you certainly did justice to her recipe! This look absolutely AMAZING! Great use of light! Jenny, I am completely on the same page with you about our wonderful blogging community! Heck, if it wasn’t for one of our mutual blogger friends, I wouldn’t have had the pleasure of meeting YOU! You did a wonderful job with these fajitas from Simply Sated! I could eat Mexican food for breakfast, lunch and dinner…and I wish I had one of these in my hands right now! Thanks for being a part of this! You have been an amazing organizer and I’m so glad we connected! Thank you for having me in the blog hop! I just had breakfast and wish I had these fajitas instead! They look incredible! Lol, thank you Aunt Bee! These look amazing Jenny! We haven’t had fajitas in ages, I need to get on this and try your variation. Thank you for sharing – and seriously gorgeous pics! I always forget about fajitas when I’m brainstorming for simple dinner ideas. Thanks for this fabulous reminder! Wow!! Yep, Wow!! 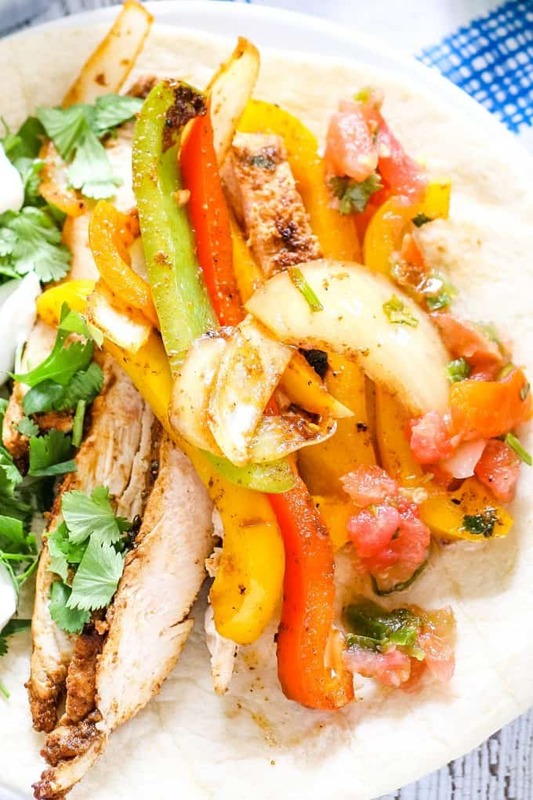 You did a fabulous job with these fajitas and your photos turned out fabulously. I wish I had a huge plateful of Chicken Fajitas right now. Thanks Susie! And thank you for the fantastic recipe! I loved it and so did my husband! Oh boy! What a scrumptious looking fiesta! Fajitas are a family favorite around here!!! YUM! OH my that looks amazing and so full of flavor! Thanks for sharing over on Weekend Bites! I have never had a fajita but if they are as good as these look then I have deifintely been missing out. I think everyone of those recipes is drool worthy. Pinning them all. Everyone went beyond expectation I think – I have added each of the recipes to my to-eat list! 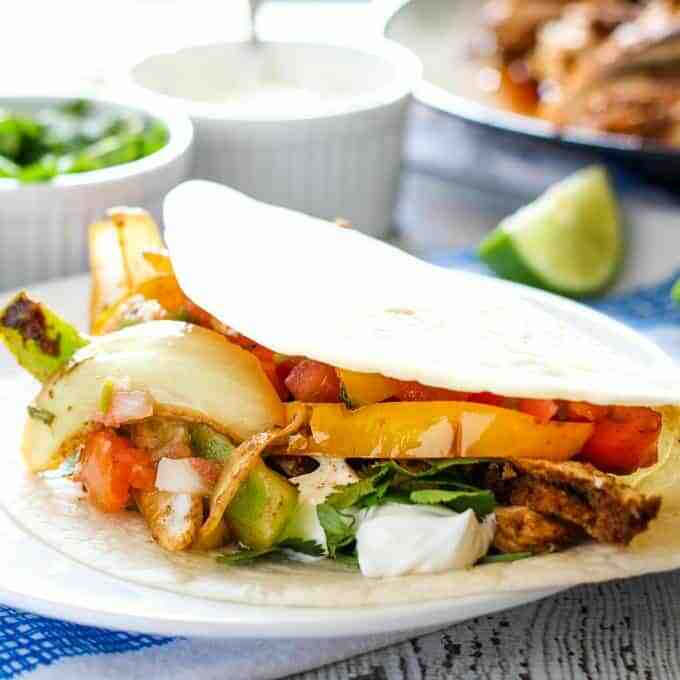 Oh my, these fajitas looks incredible, you’ve given me a real craving now I’m gonna have to try them! Love Fajitas ! Your recipe looks amazing, Jenny ! This recipe is just perfect for me considering how many times I cook Mexican during the week. These fajitas look awesome! I am huge fan of Mexican food too! I keep meaning to try other cuisines but I always go back to what I like. Thanks for stopping by! These look so tempting! My husband just peeked over my shoulder and said, “Mmm, let’s make that!” This will be on my menu for sure! Haha! Now I truly think this is a success! YUM! I am just a bit north of you, in Wisconsin, so I totally hear you on the grilling issue! I am excited to try this recipe, it sounds wonderful! Pinned! Oh, then you totally know all about winter. I think you get it even worse than we do here. These look amazing! I need to get an indoor grill! I could eat Mexican food every night! And these look awesome. Great work. Thanks for being part of Freaky Friday. I enjoyed getting to know more of your recipes. Thanks Debi – I have really enjoyed the blog hop and meeting so many awesome bloggers. 🙂 You did an amazing job with my onion soup mix. I love chicken fajitas, and these look fabulous!! I love Mexican food…we eat it every week! Your fajitas look wonderful!! Wish we were having them tonight! Thanks Michelle – I wish the recipe was my own, its so delicious! These look so good. Thanks for sharing them at the party! Shared…. Wow, I am not even sure what to say about these chicken fajitas. They look beautiful and I bet they taste great! Thanks for sharing this great post at the This Is How We Roll Link Party. I can’t wait to see what you bring next week! I am sharing this on one of my social medias! Thanks Cynthia! I really appreciate your kind words – just what I needed to start the weekend! I try to do Mexican night once a week since we love Mexican food. Will have to add this to the menu. Thanks for sharing with See Ya in the Gumbo this week. Mexican food is the only cuisine I can count on to please every member of my family. We usually use a packaged fajita seasoning but I am trying to move away from packaged foods so I was so happy to find your recipe using ingredients out of my pantry and spice cabinet. Thanks so much for linking up your recipe at This Is How We Roll Thursday. Your fajitas look amazing, great photos!!! Thanks for sharing on the #OMHGWW this week! Oh my these do look fabulous. And I bet the smell was amazing when they were cooking. Thanks for sharing your post on Creative K Kids Tasty Tuesdays. My George Foreman grill and grill pan get me through our winters!! I love Mexican food so much. There is nothing on a Mexican menu I don’t like but fajitas come as close as possible to being my favorite. As close as you can come without ACTUALLY choosing a favorite. Because that just seems wrong to me. Now I have to admit I’ve never MADE them myself but after drooling all over your pictures here that’s gonna change. Thanks for linking up at #SaucySaturdays.